The Tukwila Transportation Demand Management (TDM) Team provides programs that improve congestion, reduce fuel consumption and improve air quality for the cites of Tukwila, Renton, Kent, SeaTac, Burien, and Federal Way. These programs are possible thanks to federal Congestion Mitigation and Air Quality Improvement Program (CMAQ), Commute Trip Innovation Grant Program (CTIG) funding, and in partnership with a King County Metro Regional Mobility Grant. The TDM Team works within Tukwila and south King County under the programmatic name “South King County Transportation Options.” We offer trip reduction services to businesses, organizations and residents within Tukwila and partnering cities. Ticket-2-Ride: Try a van for 3 days free! 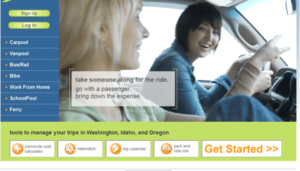 Check Metro’s rewards page to learn about rewarding rideshare opportunities for King County commuters! 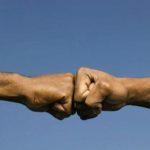 Refer a friend to RideshareOnline.com in April and earn a $20 ORCA reward! When you refer a friend in south King County, they receive a $20 ORCA card and you receive a $20 reload to your card. Visit RideshareOnline.com today, create an account and start logging trips to be entered to win local and regional rewards or to find a carpool match! This is a statewide resource for anyone living or working in Washington State. 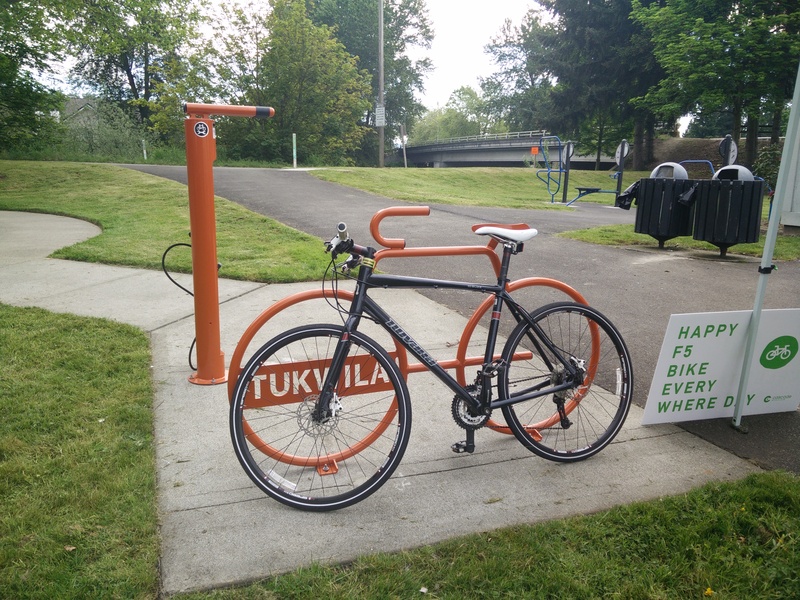 Wayfinding signage, bike racks, and repair stations have been installed in various locations within the city of Tukwila to improve pedestrian and bicycle infrastructure and provide drive-alone trip reduction assistance as part of our Small Grant Program. 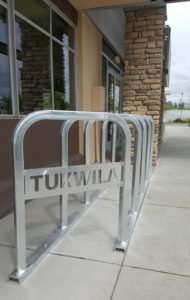 Check out some of the new bike-shaped and Tukwila-branded bike racks and bike repair stations in city parks and facilities, at businesses, and at the Library! 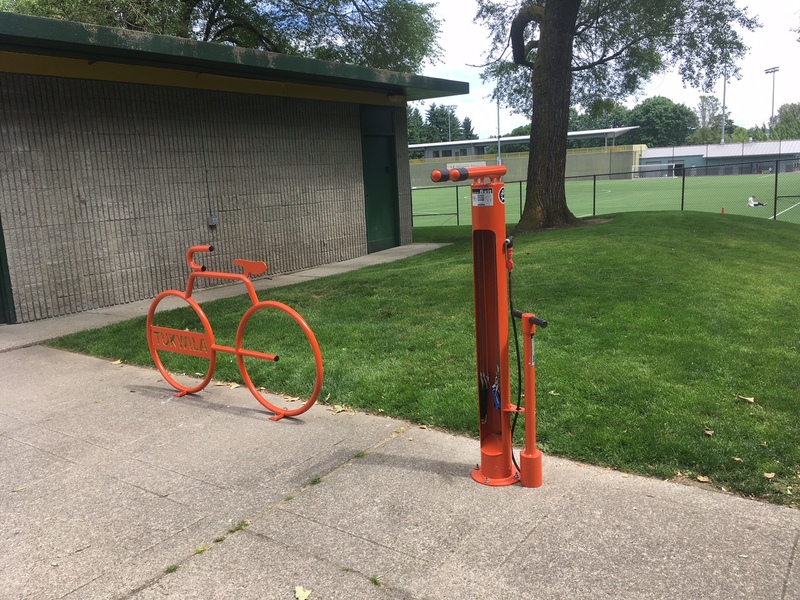 Do you want to install improvements on your property such as bike racks or lockers? Our grant program could help partially or fully fund the project. Contact us at SKCTransportationOptions@TukwilaWA.gov. 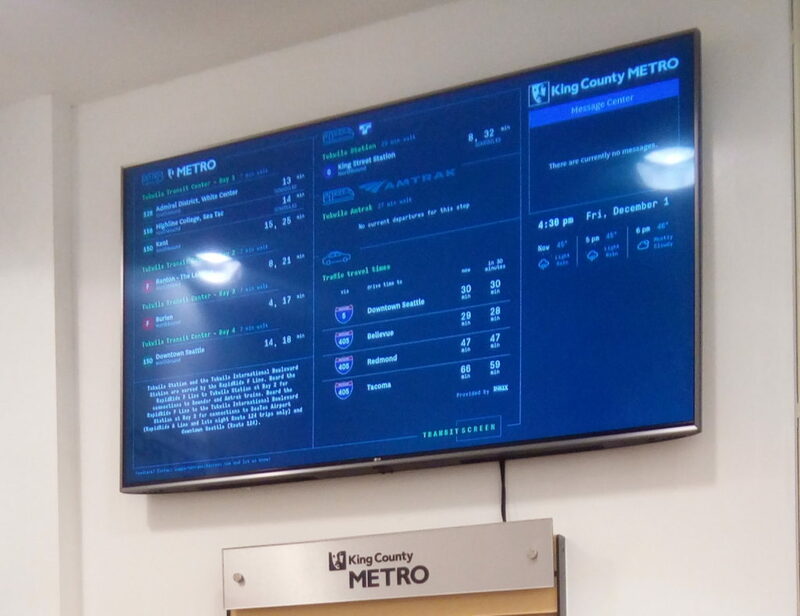 A new transit information display was installed across from the library in Westfield Southcenter Mall in partnership with the mall and King County Metro. 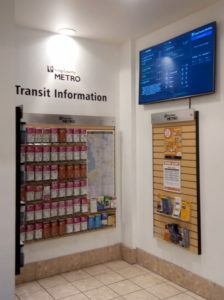 The display provides brochures and a TransitScreen, which displays real-time arrival of local transit lines! Check it out next time you are at the mall, located across from the King County Library, next to the eastern mall entrance. Three transportation surveys were administered between June 2016 to November 2017 to learn more about how people who live, work, or spend time in Tukwila and other south King County cities get around. Survey results will be posted below as they are available. Via to Transit is a new, pilot on-demand service that connects riders to and from transit hubs in southeast Seattle and Tukwila. Download the Via app (from the App Store or Google play) or call 206-258-7739 to request a ride within the service area. Via to Transit costs the same as a Metro bus ride. 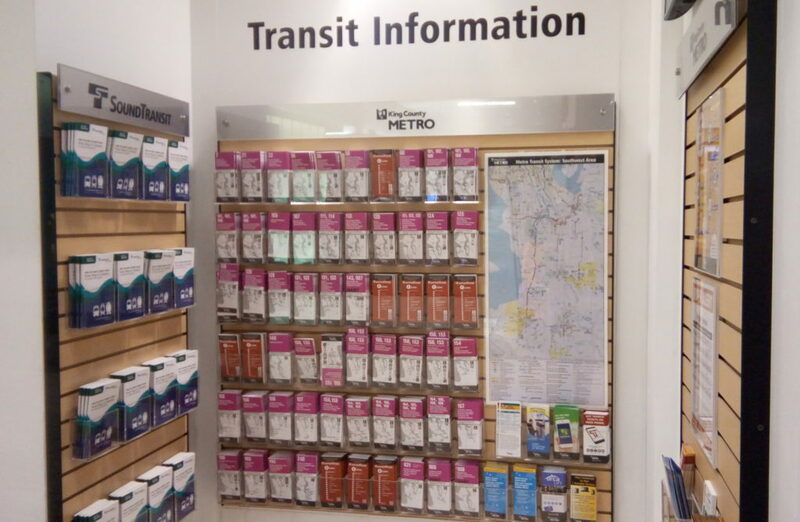 Use your ORCA card to transfer fares between Via to Transit and light rail or buses. More info here. 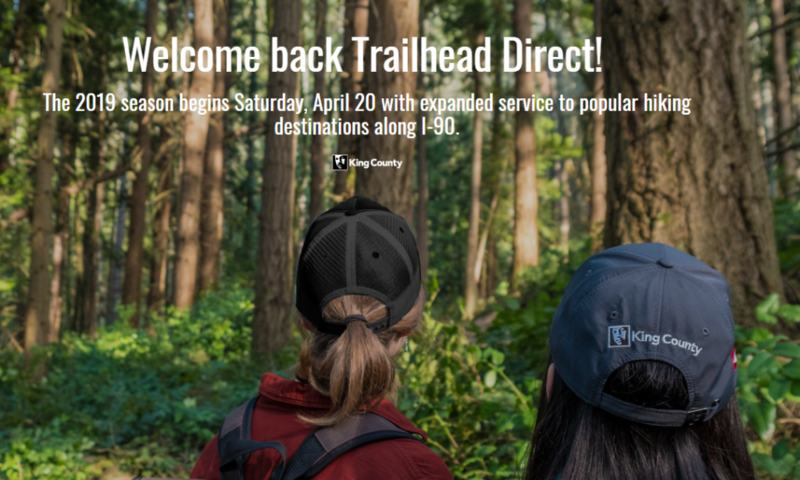 Since 2017, Trailhead Direct has connected over 10,000 hikers to trails in the Issaquah Alps and beyond, including the extremely popular Mt. Si, and the extremely difficult Mailbox Peak. Since the shuttle began in 2017, it has moved hikers east from Seattle’s Capitol Hill neighborhood and Bellevue. But this year, King County and SDOT are partnering to add a new route that stops at the Tukwila International Boulevard light rail station, the downtown Renton Transit Center, and the Renton Highlands. That route will bring hikers to trails at Cougar Mountain, and will connect with a stop in Issaquah that riders can use to connect to the Mt. Si and Mailbox shuttle routes. You can see all the route maps here. Trailhead Direct operates on weekends and costs $2.75 to ride, just like any Metro bus route. You can use an ORCA card to board, and dogs are welcome at the discretion of the shuttle driver. Woof! 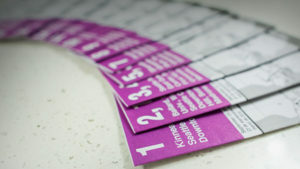 King County Metro service changes: Click here to view upcoming service changes. Service changes include routes that have new service or routing revisions. From 2016 to 2018, The City of Tukwila TDM Program partnered with Hopelink to enhance the equity of transportation services by targeting special-needs populations (including immigrants, refugees, people with disabilities, veterans, low-income individuals, and seniors) within Tukwila and our partner jurisdictions. The TDM for Diverse Communities program provided enhanced TDM services including Public Transit Orientation (PTO) field trips and one-on-one transportation planning assistance. Loaded ORCA cards and pedestrian visibility kits were distributed to further reduce mobility barriers. The partnership was successful in developing many lasting relationships with organizations in that serve the community. Please contact Katie Wendel to request hard copies of these resources. Hopelink works to “empower the community by facilitating access, supporting the coordination of special needs transportation through cross-sector collaborations to improve transportation services and providing travel education and resources to build awareness of existing transportation options.” Hopelink remains active in Tukwila and south King County. King County Metro is an ongoing TDM partner. Reach out to Katie Wendel for more information!